We here at Deckstainhelp.com remain committed to being your go-to source for all things deck staining related. See below for our ratings of the best deck stains for 2019. We want to hear from you. What is your favorite deck stain and why? Leave us a comment below. When looking for the best deck stain you cannot deny that protection, appearance, longevity, and ease of application all need to score high for a stain to be considered the best. To find the best deck stain of 2019 it needs to be mentioned that there are many variables exposed that can play a vital role in the results of a deck stain. Weather, climate, sun exposure, and even amount of foot traffic all take a toll on a deck stain. A deck stain on the west coast will be more exposed to sun exposure and heat while a stain in the Midwest or east coast will have to protect against moisture and freeze/thaw damage. In fact, it may not come down to just one single stain as being the best due to all the different factors and unique situations. There are however a few that are in the running and worth mentioning. These stains all have their own unique blend and claim different promises but we have found them all to hold up the best while providing a beautiful finish. Defy deck stains are among the best group of stains for all types of wood. Defy is a deep penetrating stain that provides a stunning finish that lasts for years. Another stain at the top of its class is TWP (Total Wood Preservative). This stain has been around for many years and has always had the reputation of an EPA approved wood preservative. Armstrong Clark Stains provide one of the most beautiful finishes ever. It also has a unique formula that utilizes non-drying oils that separate from the drying side of the formula that actually replenishes the wood’s natural oils. Although there may be several best deck stains for 2019 we hope this list will help. The deck stains mentioned have all been tested and stand true to giving consumers everything they expect in a deck stain that claims to be the best. 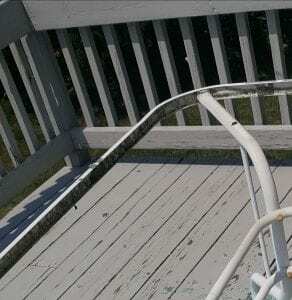 My deck was painted before I purchase my home, but is in bad shape (paint is peeling). What steps do I need to take to repaint my Deck? Do you recommend a certain brand or type of paint? Paint or solid stain? Can you post a picture? It’s a grey paint. We are having a very difficult time removing it. We tried a belt sander but the sandpaper kept getting tore up on the deck nails. We are now using this tool called a “paint eater” which works but is very slow going for a large deck. This is the best I have right now, I can take better pictures tonight when I’m at home. Looks like a solid color deck stain. Pressure wash off what is loose leaving the stain that is intact and not peeling. Recoat with another solid stain. Try the Flood Pro series solid stains. So if we have already sanded/taken off some of it, what should we do….just pressure wash the rest? What is a good paint/deck stain sprayer for the Flood Pro Series solid stains? We don’t have one so were looking into purchasing. I have a friend who offered to let us borrow a never been used Wagner Power Painting System 330. With a little research we found that this product was discontinued, but didn’t know if it was old or something was wrong with it. Would this work? if not, what do you recommend? We also have a pool deck that has a semi-transparent stain so we would like something that works for both. Thanks! You need an airless paint sprayer. Check at HD or Lowes. Never used the Wagner so not sure if any good or not. Our deck in the Washington DC metro area has more shade than “typical”, facing a wooded area with some tree braches extending over the deck It thus seems more susceptible to mold/algae. We have replaced old deck boards recently (some of which had mold/algae) with new PT wood, which we plan to stain next spring/summer. Would either an oil based or water based stain work well? Any specific stains you would recommend for this application? Thanks! For a water based stain, use the Defy Extreme. For oil based, use TWP 1500. Both do well for mold prevention. How about readseal or flood? Ready Seal is better than the Flood but not as good as the other two. Hi, I am replacing soffit coverings with pine, smooth side out. I have surplus TWP 100 that I’d like to use on this. Any reason not to go ahead with it? Might need to prep first to remove the mill glaze on the smooth wood.